The long-awaited follow-up to indie darling Braid finally gets a solid release date and a new trailer. Jonathan Blow, the oft outspoken indie game darling, has finally revealed the release date of his latest game, The Witness: January 26th, 2016, for PC and PS4. Blow enjoys a great deal of respect for his 2008 (has it been that long?) time-rewinding emotional roller coaster of a platformer, Braid. 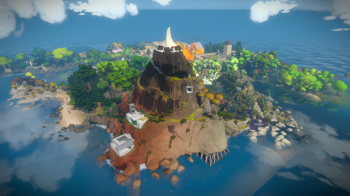 Braid was a smash hit, critically and financially, and other than the occasional remark, Blow has been hard at work on The Witness since then, with his studio, Number None. Time will tell if The Witness delivers a similar kick to the heart as the former did in its climactic moment. Then again, so little information is available about this latest game, I wouldn't be surprised if it takes an entirely different approach to story, let alone emotional roundhouses. Personally, I am very excited to find out just what this game's secrets are. Anyone else out there thrilled for this? January 26th can't come soon enough.